My classes are not only about "what happened" in the past, but how we know what we think we know. I often tell my students that history is the process of deciding which stories to tell and which stories to hide. I regularly ask them to reconstruct historical events using primary sources, which makes the study of history far more discombobulating for them, but also infinitely more rewarding, meaningful, and useful. I believe history is critical to becoming an active, engaged citizen, so I encourage students to deploy their knowledge outside the classroom as well. For examples of some of the public-facing projects my students have done, see the website of the Digital History Lab that I run at Illinois Institute of Technology. Here is a short guide on how to read academic texts effectively that may be helpful when used in conjunction with the syllabi below. Perhaps the first of its kind in the U.S., this computer history course explicitly looks at computing's past through the experiences of women who worked in computing at all levels—from data input to programming to hardware design. 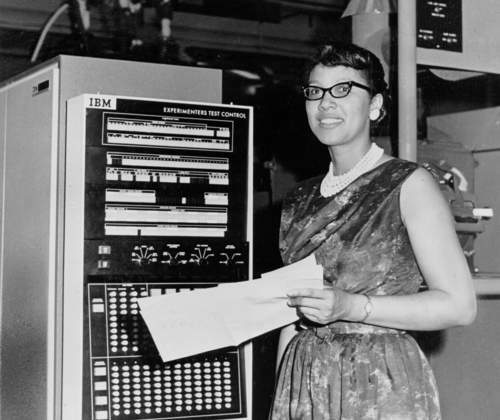 It strives to be intersectional in its analysis, showing how gender is but one window into the historiography of computing and how it must be taken together with an analysis of class, race, sexuality, ability, and many other categories in order for us to truly understand how computing structures lives and whole economies. Students did projects in this class designed to engage the public on this still largely hidden history: In addition to a wiki-storming exercise, they also created public history projects, like video games, podcasts, and comic strips. See the news coverage of their projects in Chicago Inno or this post on their projects on the Digital History Lab. I created this course as part of Illinois Tech's Digital Humanities undergraduate degree program, which I helped design. While designing the largely skills-based and technocentric program we realized that it would be very important for students to have a robust and critical understanding of how they themselves fit into the history of the digital tools they were deploying. The class looks at all forms of digital labor—from human to non-human—and takes students through the historical trajectory of digital labor from its early days as hardware programming to its more modern incarnations in the form of digital piece work. Along the way it asks students to grapple with questions about what "counts" as digital labor, and why we should care. How does what's broken in society get fixed? One way is through disasters, which sometimes require that a problem be addressed. This course uses disasters around the world to talk about how cataclysmic events can produce regulatory and legislative change. It also teaches students that not all disasters produce positive change and highlights other elements that must be present in order for a disaster to be "productive." The class invites students to look at how social and political change occurs, underscoring the fact that historical change never just "happens" in an easy or straightforward way but is always the result of struggle. See examples of student essays from the course here and here (scroll down to the comments section to read their essays, based on research done in the Times of London historical newspaper database). How does historical knowledge make it from the archive into the mainstream? This course traces that process, showing students how primary and secondary sources get turned into books, news stories, popular media accounts, and sometimes into documentary films and Hollywood movies. Students explore what is gained and lost through each successive translation, and how documentary film can be a vehicle for social justice. Students deploy the filmmaking tools available to them through the campus Digital History Lab (Sony videocameras, Roland R-05 audio recorders, and laptops with audio and video editing tools) to make their own historically-informed documentary film at the end of the semester, working in small groups that serve as makeshift production teams. They not only learn how to translate their insights into the medium of film, but also get an opportunity to disseminate historical knowledge outside the confines of the classroom. As a result they begin to understand the intellectual contributions they can make using their humanities education. Science and Technology Studies asks what sociology (the study of the social relationships that make up our world) would look like if we also included our relationships with machines in the equation. This course is an introduction to the tenets and major theories of the field. It gives students the opportunity to deploy their knowledge in hands-on ways in addition to studying theory. See here for examples of a previous class's attempts to "socially construct"—or rather reconstruct—bicycle technology. Why do we think that we've witnessed a computing "revolution" in the 20th and 21st centuries? This course contextualizes Silicon Valley's current obsession with change-for-its-own-sake by showing how the fiction of disruption has a long and well-established history. From World War II codebreaking, to intra-national spying initiatives, this course asks students to look behind industry hype and explore the interconnectedness of computer technologies with the aims and goals of strongly centralized technocratic governments. How do categories of difference structure technological design? This course is a laboratory for students to explore answers to that question, using gender as a guiding principle. To see the university-recognized class project on gendered infrastructure that students completed the last time this course was offered, read about the project on my blog here and here or read my article in Syllabus. From the Middle Ages to the present day, technology has enhanced, defined, and limited what people and societies can do. This course takes students through that history, providing a longue durée view to help them gain insight into current trends in technology. This course surveys the history of Europe in the 20th century paying special attention to the social movements that sought to bring European society into line with its oft-professed but unevenly enacted ideals of equality and civil rights for all. This class explores at how movements for sexual equality have defined the political landscape of America and Europe from the 19th through the 21st century. The course won a university-wide fellowship award for innovation in teaching when it was first taught at Duke University. This course looks at how technology and society often interact to produce thorny ethical conundrums. It teaches students to use and critically analyze the intellectual tools we have at our disposal to try to solve these difficult problems. An earlier variant of the course above, this class was offered at NC State University in order to help students fulfill their "science and human values" curriculum requirement. Looking for more syllabi in the history of technology, computing, STS, and information studies? Check out the syllabus repository of the Special Interest Group on Computers, Information, and Society (SIGCIS), (of which I am Vice Chair, USA), a subgroup of The Society for the History of Technology (SHOT).